pursued by good and bad guys alike! whether he likes it or not! from a powerful alien empire! "I could not put this book down." Each novel reads as a complete adventure, while also forming part of a three-volume story arc (or trilogy) telling a larger tale. The entire series taken together forms one grand adventure focusing on the themes of identity, memory, and loyalty as the heroes face unimaginable dangers and challenges. "There's more than enough adventure and superheroics to keep even the casual superhero fan interested, and true fanboys (and girls) will likely foam with glee." "You must read these books. They are like nothing in heroic fiction ever done before." 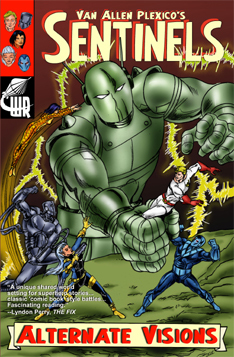 A ragtag collection of mutants, androids, aliens, gods, and super-geniuses come together to protect Earth -- and the entire universe -- from the vast forces conspiring to enslave or destroy us all....! Over 600 pages of action and adventure! Over 700 pages of action and adventure! “I was enthralled before the first chapter was over!... I couldn’t put it down. 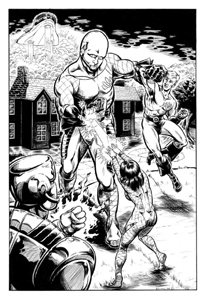 (It) captures the essence of comic book adventures... You’ll find the spirit of Stan Lee’s characters and Roy Thomas’ plots living- and- breathing in Van Allen Plexico’s writing." 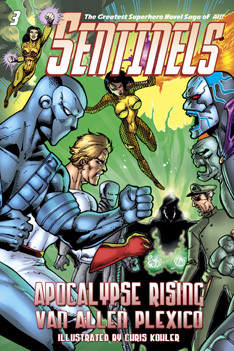 Classic Avengers and JLA comics meet Babylon 5: a sprawling canvas of a storyline, multifaceted characters (some of whom do not survive the first book, let alone the series), and larger-than-life battles on Earth and in the farthest reaches of space. NEW MASSIVE OMNIBUS PAPERBACK EDITIONS! with all of Chris Kohler's awesome original full-page illustrations. 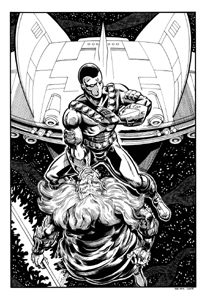 Over 130 pages of artwork and commentary by Chris and Van from all nine Sentinels novels! 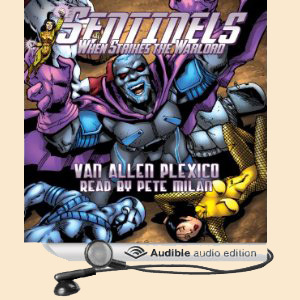 Volume 1 in the Sentinels saga is now an unabridged audiobook, performed by Pete Milan, and sold by Audible.com! 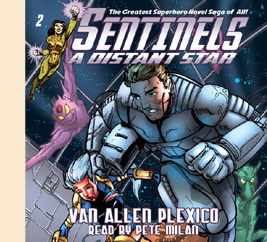 Volume 2 in the Sentinels saga is now an unabridged audiobook, performed by Pete Milan, and sold by Audible.com! 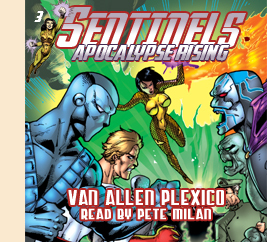 Volume 3 in the Sentinels saga is now an unabridged audiobook, performed by Pete Milan, and sold by Audible.com! New Anniversary Edition Updated Paperback! Order for the Kindle here! NOW ON UNABRIDGED AUDIOBOOK from AUDIBLE.COM! After helping to save the world, all super-scientist Esro Brachis wanted was a little peace and quiet. But then the giant, adapting robot attacked. And the alien warships landed in his back yard. And then things got really crazy. At least he has a beautiful alien warrior woman at his side... if only she didn't want to kill him! 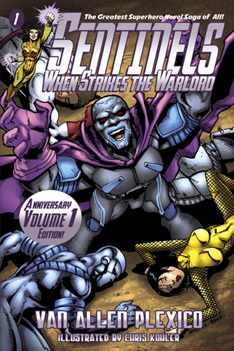 Menaced by super-powered villains, trans-dimensional warlords, and alien invasion fleets, the Earth cries out for its heroes. 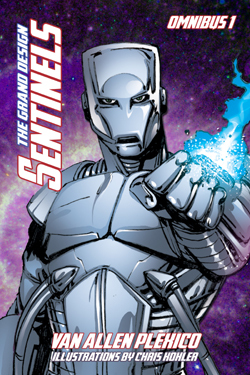 But the Sentinels have vanished! Now Pulsar stands alone, down but not defeated, and determined to rescue her teammates... and her world. Order the paperback from Amazon.com here! The Worldmind has dispatched his top lieutenant, the murderous Vanguard, to Earth-- with orders to open the way for ultimate planetary annihilation. 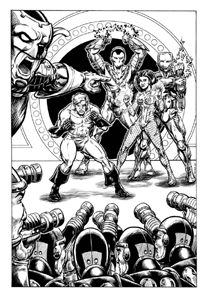 Standing in the way: Ultraa, Pulsar, and a motley collection of heroes-- and villains-- who must overcome their old rivalries and work together, if Earth is to have any chance at all. 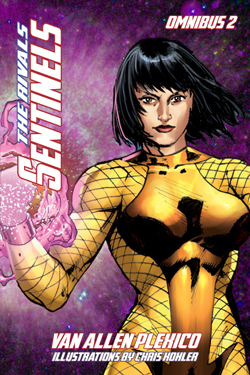 The planet-destroying Worldmind stands poised to annihilate the Earth, but our mightiest defenders are gone! 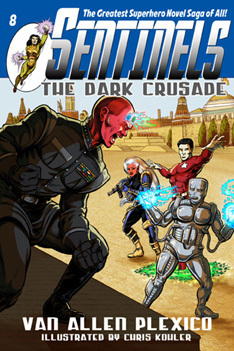 Ultraa confronts an alien tribunal on the far side of the galaxy. Vanadium faces charges of treason against his own kind. 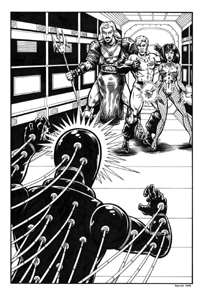 And so Pulsar and her remaining few teammates have no choice-- as zero hour approaches, they must launch a daring-- and terrifying-- raid into the very heart of the Worldmind. The situation is dire. Four vast and powerful cosmic entities stand poised to destroy the Earth, while the spaceborne nano-virus called the Blight turns everyone--human and alien-- into mindless zombies. 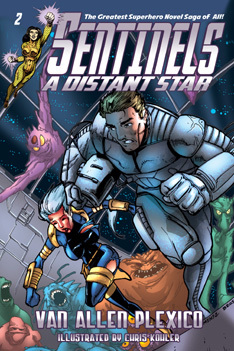 Now Lyn Li and Esro Brachis must lead a ragtag group of heroes and villains on a desperate mission. If they’re going out, they’re going out with a bang. It’s one last hurrah-- before the end of the world! 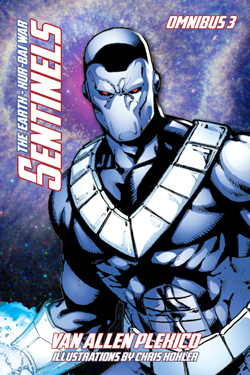 The Sentinels have scattered to the four winds--but there’s little time to relax and recover, as the dangers facing Earth have never been greater. Esro and Mondrian cross the depths of space in a desperate attempt to stave off galactic civil war, while Pulsar and her sister work to assemble an entirely new team of heroes back on Earth. 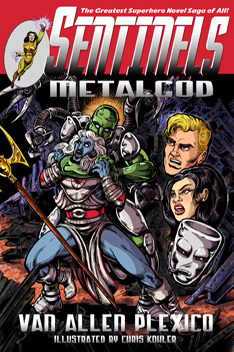 Now time is short, and the supply of heroes shorter, and enemies old and new lurk at every turn; foremost among them the deadly mechanoid from space--the herald of doom--the being known only as METALGOD! Masquerading as the heroic “Law,” the arch-villain known as the Black Terror has seized control of a vast starfleet and set out to conquer the mighty Kur-Bai Empire. 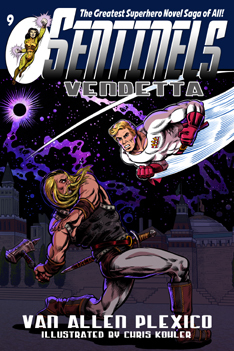 Trapped on opposite sides of a galactic civil war, Esro and Mondrian fight alongside the Elites, Shiva battles inner demons, and a weakened Vanadium finds himself held captive, while the Red Star pursues his own mysterious agenda. 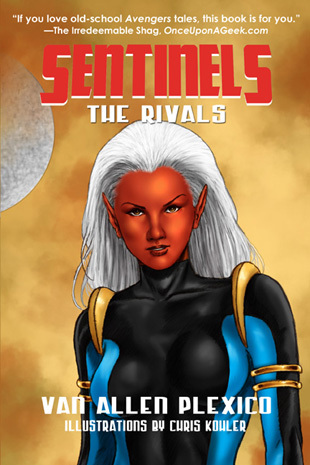 Now, as war engulfs the galaxy, Pulsar and Wendy must decide on whose side they will fight. 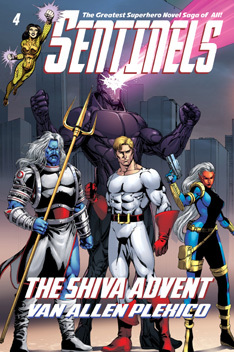 Will they join with Earth’s alien foes, or will they trust their greatest enemy, even as he launches... THE DARK CRUSADE! The Black Terror's massive invasion fleet has reached the Kur-Bai throneworld--and Earth's greatest super-villain is about to conquer the greatest star empire in our galaxy. With most of the human and alien heroes defeated, only Pulsar and her few remaining allies stand between two deadly foes. Somehow they must overthrow the mad tyrant of Kurizon, while also stopping the Black Terror's bloody VENDETTA! 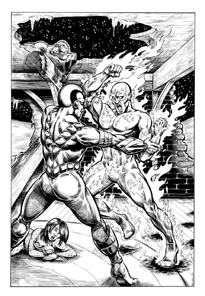 Plexico manages to create some of the most readable action scenes around." 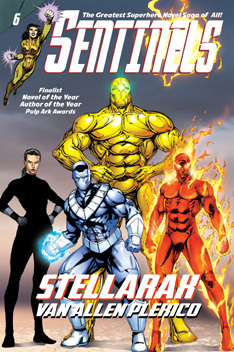 AUDIO: Hear Van talk about the Sentinels novels with Ric & Art on the Book Cave! 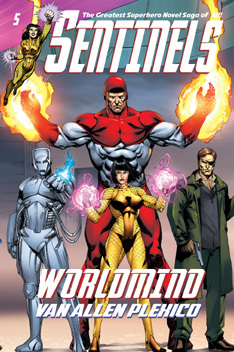 AUDIO: Hear Van and co-creator Robert J. Politte discuss the inspirations for the Sentinels on the White Rocket Podcast! 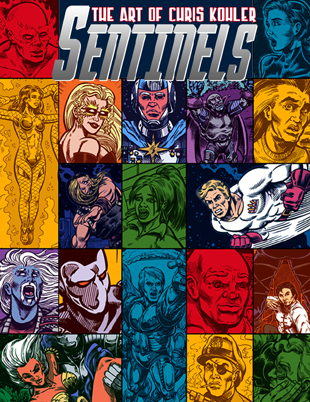 The Sentinels have a page on Wikipedia! 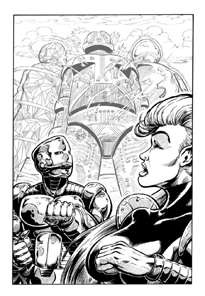 The above is just a sample of Chris Kohler's interior artwork for this series. Each novel includes five full-page illustrations!